Location of Desert Edge in Riverside County, California. 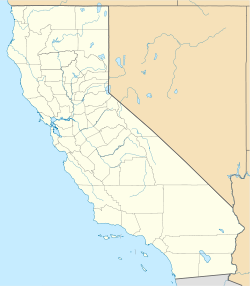 Desert Edge is a census-designated place in Riverside County, California, United States. Desert Edge sits at an elevation of 994 feet (303 m). The 2010 United States census reported Desert Edge's population was 3,822. The population was spread out with 514 people (13.4%) under the age of 18, 127 people (3.3%) aged 18 to 24, 474 people (12.4%) aged 25 to 44, 884 people (23.1%) aged 45 to 64, and 1,823 people (47.7%) who were 65 years of age or older. The median age was 63.8 years. For every 100 females, there were 92.0 males. For every 100 females age 18 and over, there were 89.6 males. ^ "2010 Census Interactive Population Search: CA - Desert Edge CDP". U.S. Census Bureau. Retrieved July 12, 2014. This page was last edited on 5 May 2018, at 15:32 (UTC).